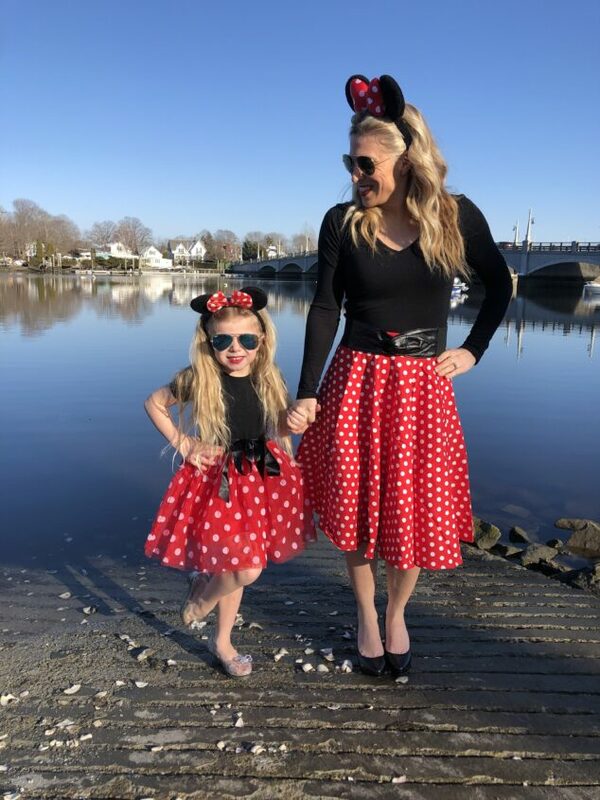 Who here is a fan of creating a DIY Minnie Mouse Costume? I’m raising my hands extra high right now! Actually – I’m raising both of my hands up in the air right now. Minnie Mouse is our girl and we just adore her and love her at home. When my 4 sons were younger it was all about Mickey Mouse, now that Victoria’s here it’s ALL about Minnie. 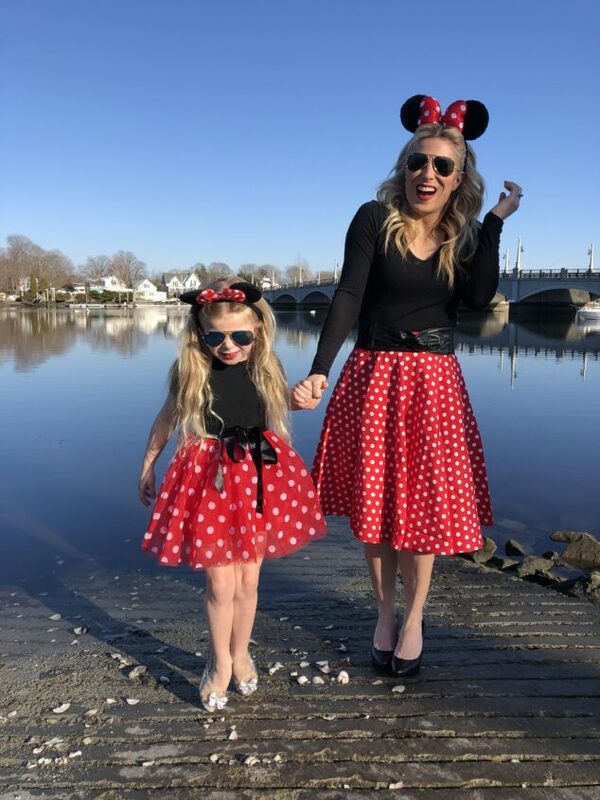 We partnered up with some of our fave bloggers to create some fun Disneybounding looks and (of course) Victoria wanted to do the Mrs. Mouse first! 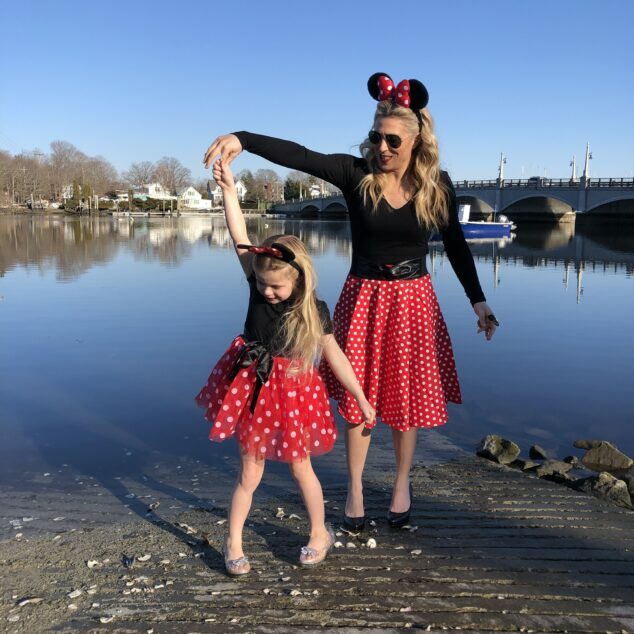 I’m thrilled to share with you our DIY Minnie with you today on the blog! If you’ve been wanting to do a Disneybounding with some of your favorite characters or princesses or heroes, my first piece of advice is to head to Amazon. 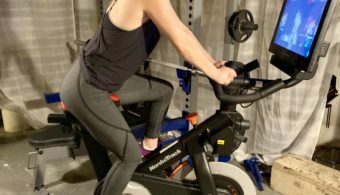 Don’t laugh – I’m not kidding Amazon is the mecca for finding what you need at some incredible prices. 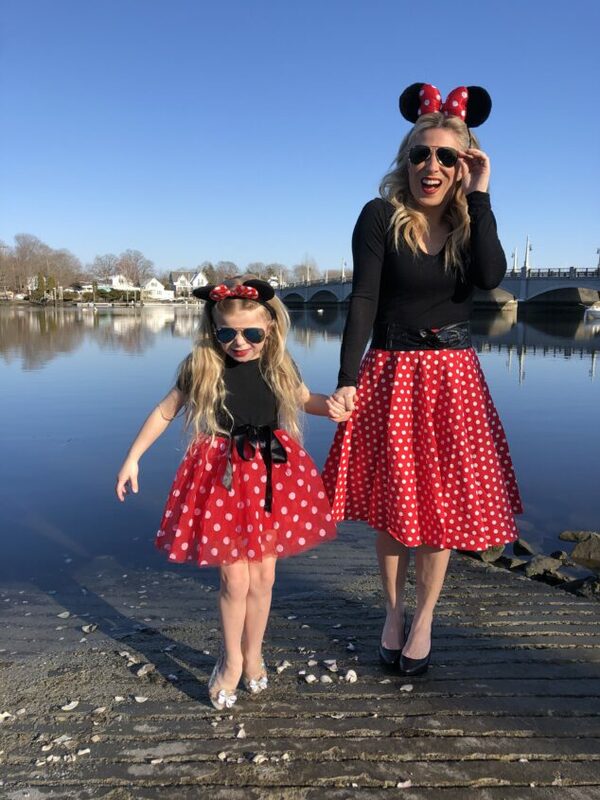 I want to bring you through how I easily (and reasonably) put together my DIY Minnie Mouse Costume for UNDER $50! That’s right – BOTH COSTUMES – under $50! You can’t beat that at all! First things first… find a photo of who it is you want to dress like and start coming up with a costume idea. Since Minnie Mouse is all about the black top and red skirt with white polka dots, that’s where I started. I knew that if I had the iconic red skirt, everything else would easily fall into place. Not to mention the Minnie Mouse ears – they are the other staple to making this look come together. You can’t be Minnie without the ears! 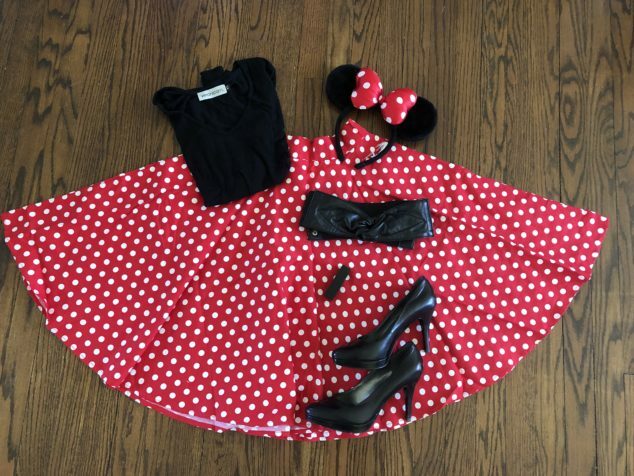 Here’s what I bought for my Minnie Costume: Black top, Red skirt with polka dots, black belt, black heels, red lipstick and Minnie Mouse ears. For Victoria? It was pretty easy. I just searched on Amazon for a Minnie Mouse Kids Costume. The second I saw this costume, I knew it was perfect for her! I’m talking that BIG tulle skirt… it’s just about everything that she loves and then some! She looked like a little Disney princess when it was on her! It was the cutest ever! 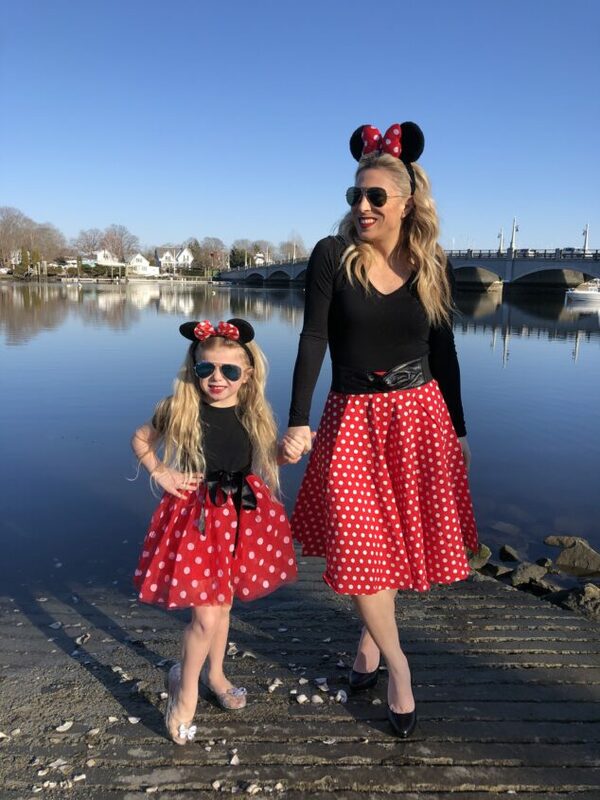 When we came together with our Disney outfits… they just fit perfectly! I can’t quite describe the excitement that we both had once we saw the Minnie Mouse costumes come together! As you can see – we’re dancing our little Disney loving selves around! Even the super cold weather couldn’t keep us down! We just really fell in love with the spirit of Disney! This is something that connects us and we just love it! The best was seeing Victoria dance near the water and have a good ole time!! She’s a happy little girl and gets a kick out of being dolled up with me for anything! After having 4 sons – I’m embracing these moments with her and soaking it all in! I love watching her light up and get all giddy with anything Disney! And… check out Victoria’s shoes! She’s rocking her Ariel princess shoes for the Disney win! 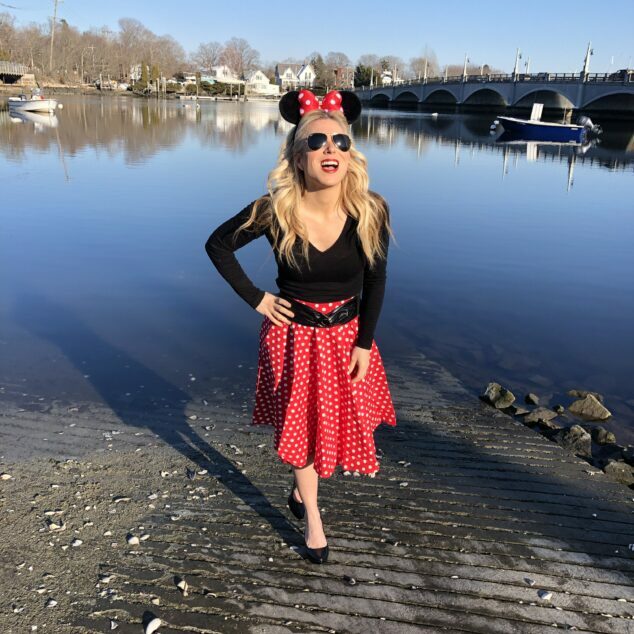 I’m telling you right now – it’s super easy to do Disneybounding, especially as Minnie Mouse! 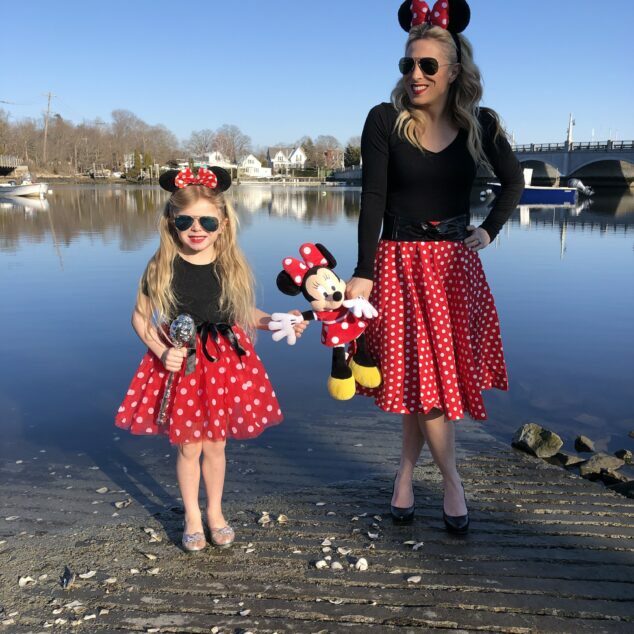 I even put together a video from beginning to end of our DIY Minnie Mouse Costume coming together. I think the biggest misconception is that you need to make sure you’re getting every single little detail. Truly? 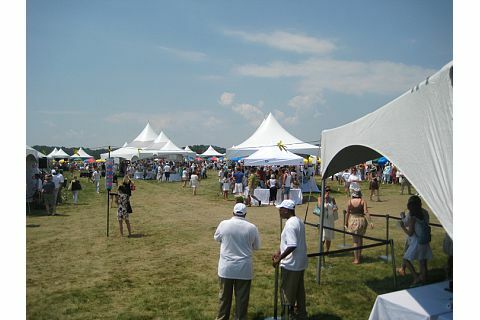 It’s all about really honing in on a few details that will make the look pop! As I mentioned above – I honed in on the skirt and ears… everything else I just used what I had at home! Minnie actually wears yellow heels. I went with black. Minnie actually has a yellow belt. I went with a black one. Make it your own and make it YOU! I love fashion, so I really knew that this skirt was going to be one I could wear again and again and again. I figure in the summer I could rock it with a black and white tank! Something easy as can be and adorable and sweet at the same time! I created this VIDEO for you to check out! The most important thing is just to have FUN!! 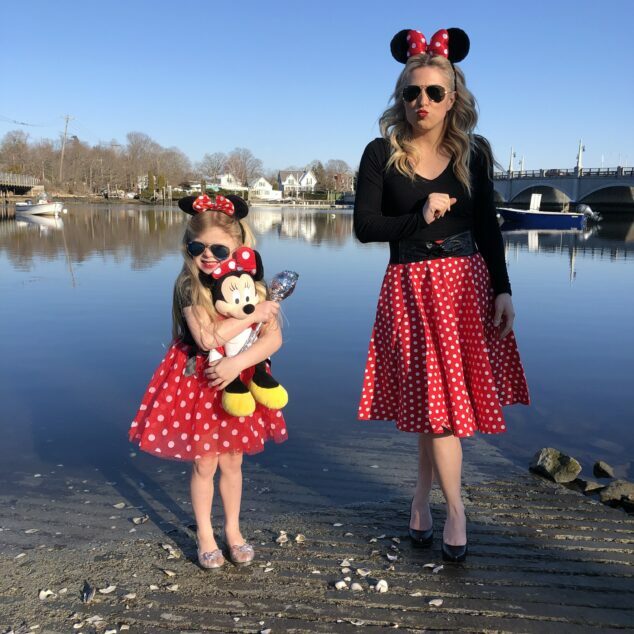 Find a Disney character for your Disneybounding that works for you! I’m going to start a series with Victoria now where we do this once a week! She loves every Disney thing ever, so it’s fun to see her get so excited about transforming into someone else! I just ordered some items for our next 2 Disneybounding people and we can’t wait!! I can’t tell you who quite yet… shh!!! Not to mention – there are just somethings in life that you can do with your kids that you love doing! I know that she loves it as much as I do. I know that I get magic out of this with her. I know that it fills me up. I know that it’s something that I will remember doing with her forever! I know she won’t want to be twinning with me when she’s 16 years old (at least I don’t think she will!). For me – it’s all about bottling up this magical time right now! 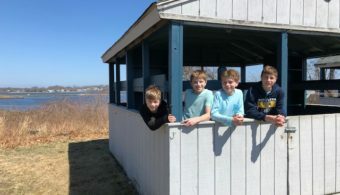 But – the best news is that I didn’t do this alone! I partnered up with some of my blogging friends to share the Disney love! Check out my magical Disneybounding friends. We all picked someone different!! Come follow us over at DisneyBoundingGirls to see what we all chose!! It’s a bunch of fun to see everyone’s photos come to life!! 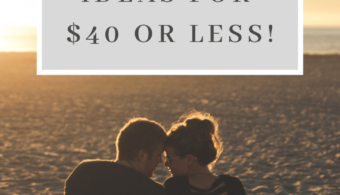 Right now (through 3/23/19) we have a $300 Disney Gift Card GIVEAWAY!! It’s exciting!! So please come and enter!! 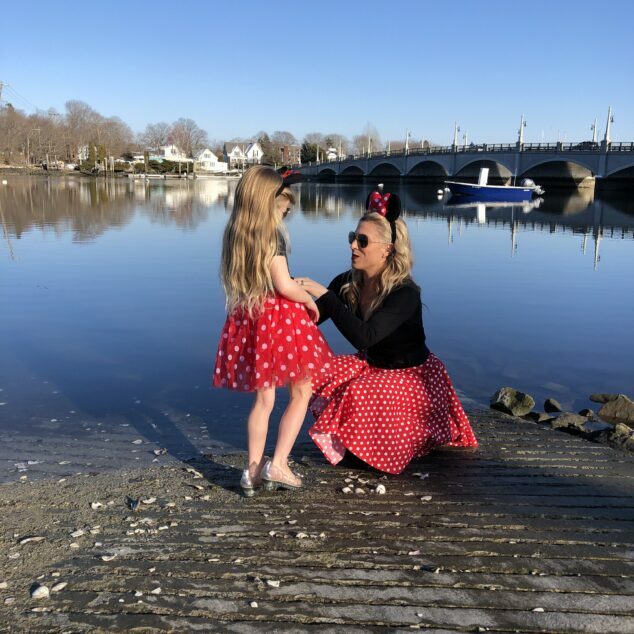 I’m telling you – the Disney magic is alive and well! 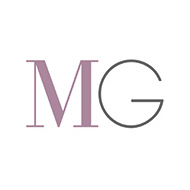 And as always – if you have any questions – feel free to drop me a line! Minnie dresses are so pretty! I love the polka dots. Cute idea! Costumes are fun, and both this and the Mary Poppins ones are good choices of characters. I expect Victoria will have fond memories of these experiences. These outfits are adorable! You got some great photos! 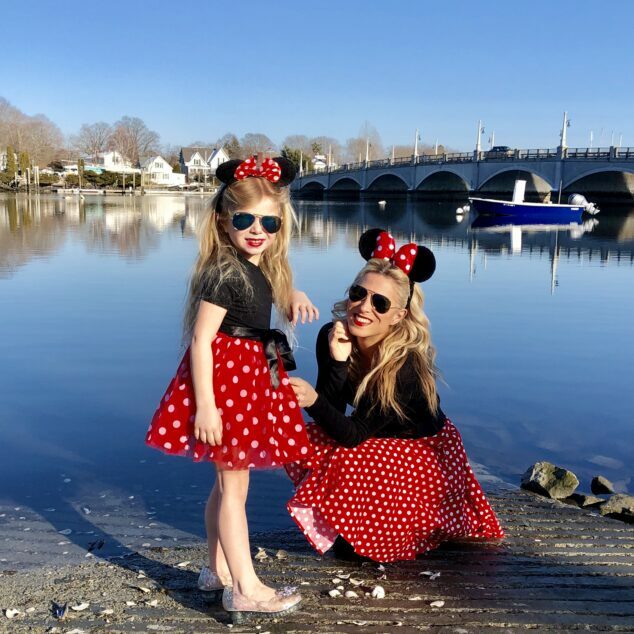 I love these matching Minnie costumes! So cute. And so easy to do! Your costumes are spot on! Isn’t it fun having a daughter you can do girly things with?